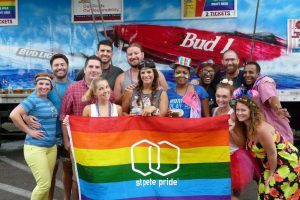 From cute kids to the endearing elderly, the St. Pete Young Professionals (SPYP) impacted the city of St. Petersburg in many ways through Community Service in 2016. 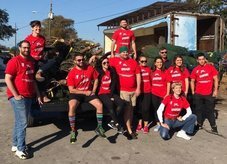 Check out some of the notable service projects below that SPYP participated in last year, racking up over 1,000 hours and connecting young professionals with the community to give back and make a difference. 2016 marks the first year a Request For Proposal (RFP) process was used to select the annual service project with Guardian Ad Litem (GAL). 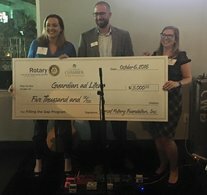 An executive committee reviewed the 20 proposals submitted by local nonprofits and narrowed it down to GAL, pledging to 1) assist with the annual SuperHero 5K 2) provide an organized space for Guardians to “shop” for the children they support 3) partner with the St. Petersburg Sunset Rotary to raise and present $5,000 to benefit children’s needs. Many hours were spent in meetings to organize, plan and execute the service project goals with special focus from Lauren Duffy, who headed the Annual Service Project committee. The PACE Center for Girls in Pinellas was also a large focus last year. PACE was in contention to be the Annual Service Project. 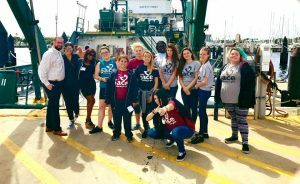 The members of SPYP decided to also partner with PACE to to organize PACE Day, where the students had the opportunity to see women in leadership around St. Petersburg, as well as potential career paths they could follow. The girls were given disposable cameras and journals to document their exciting day. 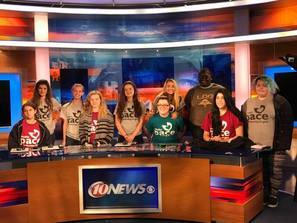 They visited 10News, John Hopkins All Children’s Hospital and the Weatherbird II, a marine research vessel docked at USF St. Petersburg’s campus. Melanie Gunaratna devoted time and efforts to making PACE Day a reality and was able to participate in the day as it unfolded. Many other events made up the hours that contributed to the 1,000 hour goal and offered different opportunities to impact the community. It is estimated that 7,000 children in our community are chronically hungry. The Pack-a-Sack program through the St. Petersburg Free Clinic provides children with food for the weekends when they aren’t receiving free breakfasts or lunches at school. SPYP was able to lend some helping hands on a Saturday afternoon with 40 volunteers packing 2,016 sacks, which included milk, juice and other healthy snacks. 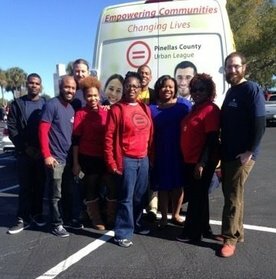 SPYP participated in one of the signature events of St. Petersburg by partnering and marching with the Urban LeagueYoung Professionals in the MLK Day Parade. The volunteers passed out candy to children and supported in the festivities. SPYP showed up, dressed up and poured beer for the thirsty folks walking St. Pete Pride to support and benefit the LGBTQ community. All proceeds went to supporting and funding the annual service project. The opportunity to participate this past year was especially impactful as the timing was soon after the Orlando Pulse Club shooting. Supporting Pride in 2016 was a great opportunity to pay tribute to those lives lost. To wrap up the year, SPYP joined with more than 100 volunteers at the YMCA Neighbor to Neighbor Christmas Program to deliver Christmas trees, stands and decorations to families in need within St. Petersburg, making their holidays a bit brighter. With two service projects already completed in 2017, SPYP is well on its way to continue impacting the community. Want to get involved? The Community Service and Engagement Committee meets the second Thursday of the month at 6pm at Station House. This is open to members and potential members. Comment below and tell us about your favorite service project from last year!